I don't know about you, but after the onslaught of Thanksgiving dinner gluttony, I am usually too full for dessert. However, there is something in my brain (or stomach-- stomach be quiet already) that tells me I need to cap off the day's eating with something sweet. 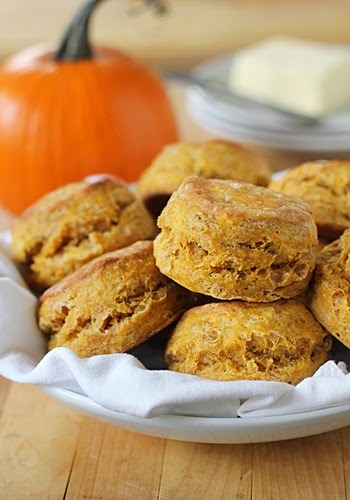 I have shared my recipe for Pumpkin Cream Cheese Truffles ---now it's time to share these tasty little morsels. The original recipe called for adding pecans to the fudge mixture. After making the tart I posted this past week, I wanted to top this batch of fudge with some of the candied walnuts I used for the tart. I won't make it any other way now. They add a nice, sweet crunch. Plus, my personal tastes dictate a little texture in my fudge. If you're not a nut lover, just omit them from the recipe. The fudge is quite simple to make, but you do need a candy thermometer to make sure you reach the proper temperature. 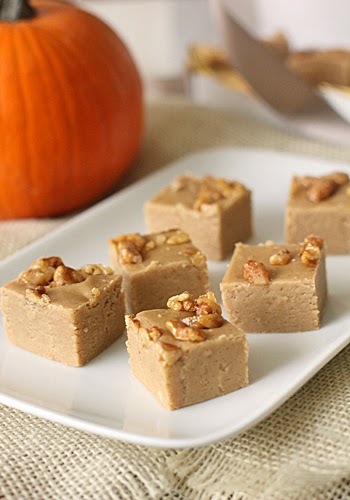 This fudge makes for a great last minute sweet for the dessert table or a nice hostess gift if you are joining others for Thanksgiving day. I couldn't share the basics of the sweet tart dough without sharing a delicious seasonal tart for the holiday table. So in lieu of a Sunday dinner menu post, I am going to share the tart that we enjoyed last Sunday. And boy did we ever enjoy it. The recipe called for a different crust baked in a spring-form pan. It seemed rather cumbersome in my opinion, so I went with my gold standard. The recipe also called for candied pumpkin seeds, but I fancy the flavor combo of pumpkin and walnut. Pecans would be a nice alternative too. 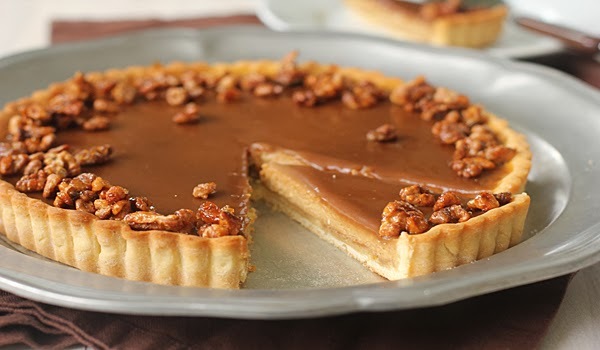 The tart is pre-baked and then a thin layer of caramel is spread over the bottom of the crust. The sweet pumpkin filling is poured and then baked until set. Once cooled, the remaining caramel is spread evenly over the top creating three dreamy layers of sweet bliss. Sprinkle the edges with the candied nuts and, well--move over pumpkin pie. You are still really good, but there's a new dessert in town! If you are a regular reader you know that I love me some sweet tarts. 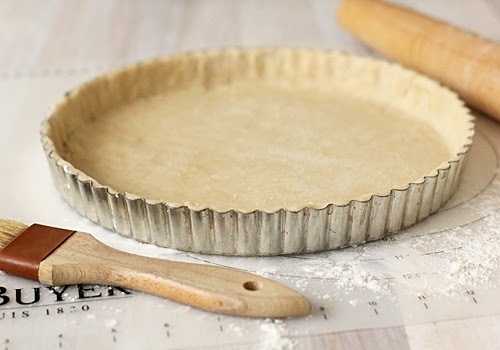 Don't get me wrong, I love pies (and cakes, and cookies, and ice cream, and just about anything with sugar in it;), but in my opinion the ratio of crust to filling in a tart is a better than a pie. Plus, I just think tarts are purty. I have quite a few sweet tarts on the ol' recipe page and it's about time that my favorite tart dough gets its own little space in the world. Make some this weekend and place it in the freezer for next week's baking frenzy. And stay tuned for another delicious sweet tart recipe that will be perfect for the holiday table. 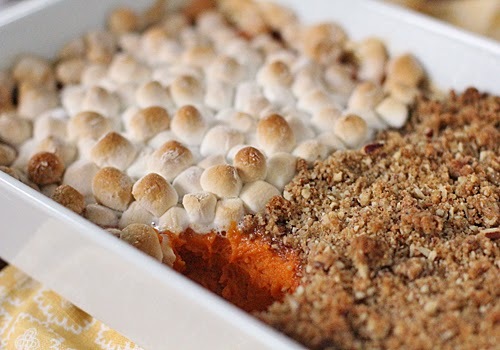 The recipe calls for sweet potatoes, but I like to use those Southern red yams. I find that their flavor and color are deeper. Instead of boiling, I like to roast the potatoes (or yams). This brings out the natural sugars. With that pronounced natural sweet flavor, I dial back on the sugar and butter in the recipe. I save those ingredients for dessert. This recipe can be made in advance. I make it the day before (topping and all), cover with plastic wrap and store in the refrigerator. Once the bird comes out of the oven, I slide in this dish along with the Cornbread Dressing (that can be made the day ahead as well). Bake until lightly browned and toasty. My youngest daughter was doing a segment in class about ancestry this past week. As the older two kids took the Polish and Norwegian parts of their all-over-the-map European heritage for their ancestry projects a few years back, I suggested that she use the German part of her background. I'm glad I did, because it inspired this menu. The livers are soaked in buttermilk prior to use. This step serves to round off the sharp and bitter taste of the liver, making for a milder impact on the palette. The apple in the mix lends a welcome note of sweetness. 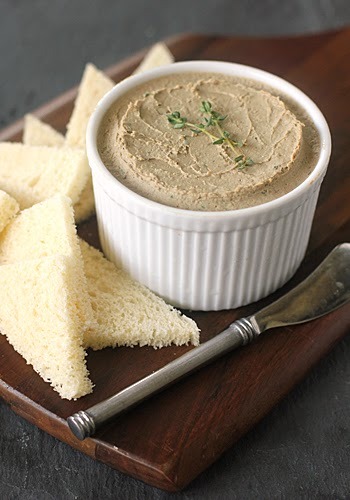 This paté is a perfect appetizer for nights this time of year when it gets dark at 5pm. A piece of toast with liver pate and a beer or glass of wine makes for happy hour bliss. As much as I love spending time in the kitchen on most weekends preparing for Sunday dinner, the weeknights don't allow me that luxury. I am usually shuffling to or from soccer practice, basketball games, and bowling matches for my three children, so I have limited time to get dinner on the table. 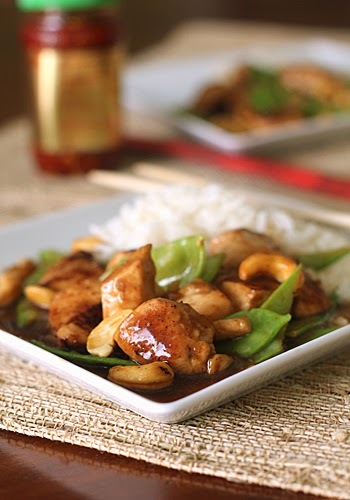 But rather than pick up some take-out on the way home, I pull out recipes like this one. Fake-out take-out is what I call it. It is quick, fairly easy, and very satisfying after a busy day for me and my family. My oldest son Jack, can't handle the heat like the rest of us can, so rather than using red pepper flakes in the stir-fry, I like to serve it with Thai chili garlic paste on the side to taste. Not only does it add some kicked-up heat, it also elevates the flavor of the overall dish. Serve as is or over steamed white rice. This recipe will have you reconsidering that dialed-up take-out meal. Sunday Dinner Post Take II... For those of you who receive e-mail subscriptions or if you just randomly clicked on my site this morning, you'll know what that means. I inadvertently hit the publish button yesterday when I was typing up the post. 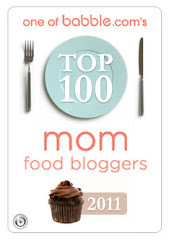 So please disregard that recipe, since it had yet to be edited. Funny-- looking back on Sunday dinners past. 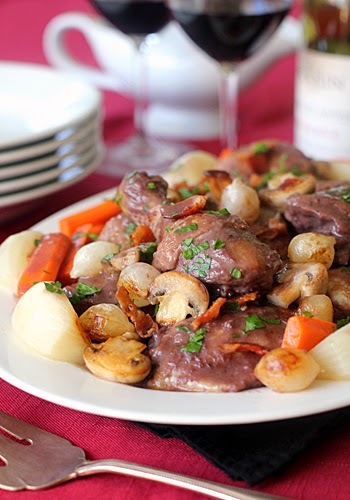 We had Coq au Vin more than once on the same weekend. It must be programmed in my head to serve it at this time of year. There are several steps to this recipe, but hey its Sunday (not a busy weeknight) and it's worth it. Chicken braised in an enriched red wine sauce enhanced with the flavors of bacon and pearl onions gets my cooking motivation in gear. Potatoes are all you really need, but I like the addition of turnips and carrots for a heartier meal. And the sauce, oh the sauce... any leftovers are wonderful on a piece of toast with a simple salad for light and easy weeknight meal. I didn't want the week to go by without sharing one of the Sunday dinner recipes. I'll start with the appetizer and save the dessert for another Sunday ( I just need to tweak it a bit). With the holidays around the corner, this would be a lovely starter, appetizer, or amuse bouche to start the festivities. I love this recipe for the fact that you bake a whole rectangular tart and then cut it into little squares. No fussing with little tart pans or mini muffin cups. And we all need those little shortcuts during the holiday rush. 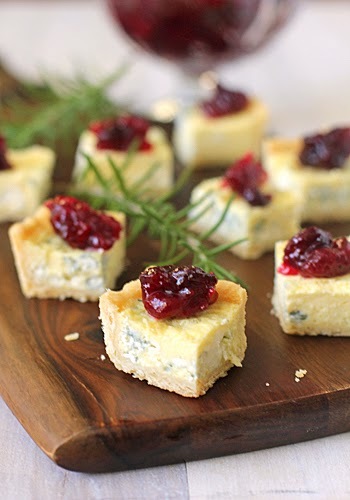 The original recipe called for Stilton, but I find that a rather assertive flavor for a tart. (Save that pricey Stilton wedge for a nice cheese board instead.) I use a quality, creamy blue cheese instead. I recommend using a block form and crumbling it yourself because the pre-crumbled can taste rather off and it is a bit salty. The cranberry chutney is a wonderful pairing with the pungent flavor of the blue cheese, but with the holidays in mind, I swapped out the ginger in the recipe and use chopped fresh rosemary. The flavors really blend well together. Of course it is best served the day that it is made, but with a busy weekend last week, I made the tart the day before and reheated it in the oven just until warmed the next day. It worked out perfect and it is quite delicious. The chutney might be a nice addition to go with your holiday bird as well. It's that time of year when the weather calls for warm comfort foods on one day and then something light and refreshing the next. We recently had a brief (and I mean brief) warm up, so I planned for a simple meal of a seasonal panini and salad for dinner one night. 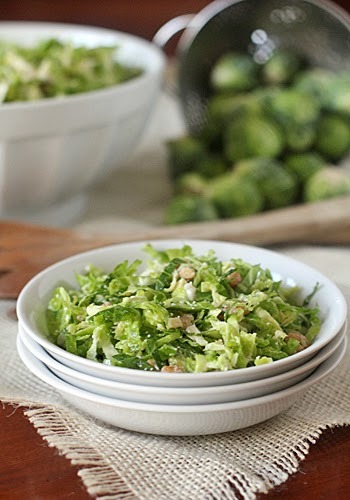 I'm always looking for a way to get my children to eat their sprouts as they can be a hit or miss veggie from dish to dish. The original recipe called for just lemon juice, but I opted to swap out some for a good balsamic vinegar. It paired nicely with the cheese and really brought all the flavors together. This one was definitely a hit! There is a method to my Sunday dinner madness this week and it is all because of an afternoon soccer game on the north side of Chicago. All that driving limits my time in the kitchen so I needed to have a menu that can all be made in advance. Yesterday I made the tart and chutney. I also partially cooked the lentils, made the base for the vinaigrette, mixed a batch of dough, and cooked the dessert. The bonus-- I had some sausage in the freezer from a previous batch. 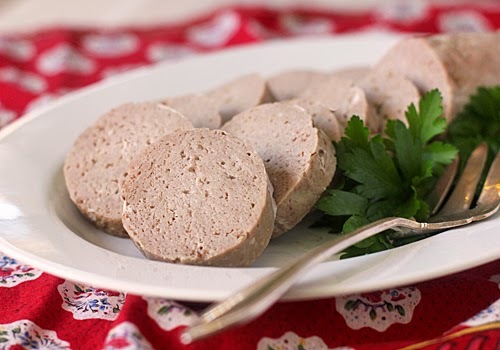 I started making my own Toulouse sausage years ago when I was unable to find it. It is a classic French sausage that is mixed with white wine, garlic, and a little white pepper. I use Jaques Pèpin's technique for forming the sausage. There is no need for hog casings, just plastic wrap and aluminum foil. It cures in the refrigerator for several days to allow the flavors to blend. I form the sausage mixture about 2 1/2 inches in diameter. Once cooked and sliced, a few slices make for a nice serving size. I serve this sausage over French lentils in the fall and winter months and over a French potato salad during the spring and summer months. I also use it when making my birthday cassoulet (step one of that recipe).